Iron has an argon core, and 6 (of a maximum of 10) 3d electrons, 2 (of a maximum of 2) 4s, and 0 (of a maximum of 6) 4p electrons. Or, 8 = 2 + 0 + 6 rather than 18 = 2 + 6 + 10. So Woodward and Wilkinson argued that sharing a further 10 electrons would bring iron up to, in effect, a Lewis shell (albeit one using not just s and p shells, but d shells too). These 10 electrons would be provided by two cyclopentadienyl radicals. Thence a Nobel prize (for Wilkinson)! But wait! QTAIM analysis for Ferrocene. Green=bcp, red=rrp, blue=ccp. Firstly, let me adjust slightly the counting above. Rather than starting with neutral Fe, we ionise it to Fe2+. Rather than starting with two cyclopentadienyl radicals, let us use two aromatic cyclopentadienyl anions. But now, Lewis' idea of covalency via shared electron pair bonds struggles. If 18 electrons really are being deployed (12 from the cyclopentadienyl anions, 6 from the Fe2+), does that imply 9 shared electron-pair bonds? How might the bonds in ferrocene be represented? This matters. Since the 1970s, the idea of searching for molecules via what is called its connectivity (a simple index which ignores bond order, and simply specifies whether two atoms are connected by a bond, any kind of bond, or not) has revolutionised searching for molecules. Think of CAS, Pubchem, REAXYS, CCDC, and SMILES and InChI. 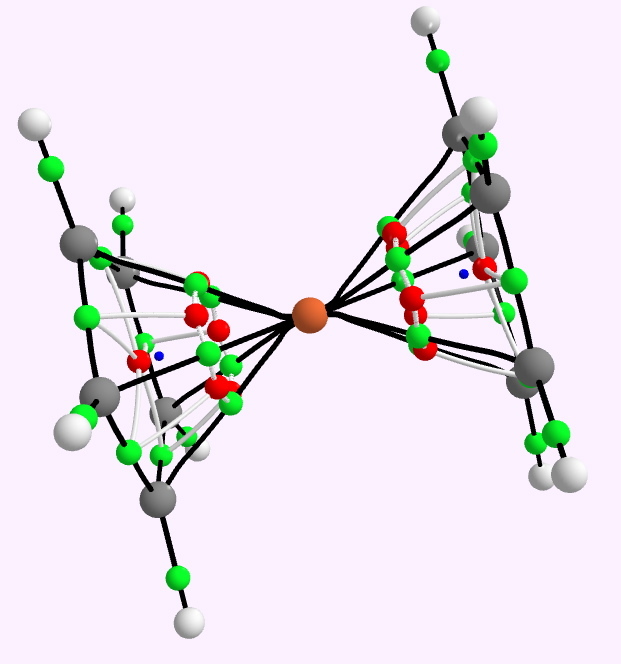 So is it useful to try to partition 9 bonds into ferrocene (it kind of difficult, since it has five-fold symmetry)? Indeed, most students trying to search for a ferrocene in any of the aforementioned databases will scratch their head over this one. 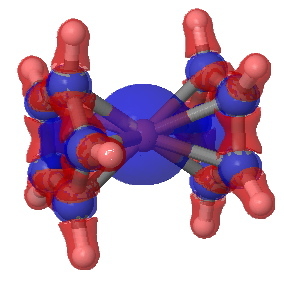 The normal solution is to draw 10 bonds from the iron, one to each of the ten carbon atoms (and the databases accept this as a valid search query). But what can that mean? To find out, I show here a QTAIM and an ELF analysis of the bonds (in italics, since we do not know if these conform to Lewis covalent bonds or not). The QTAIM is shown above, and it shows a bond-critical point along all ten of the Fe…C regions. The electron density, ρ(r) at each of these is 0.083 au. In truth, this is rather low, even for a single bond. The Laplacian ∇2ρ(r) at each of these points is +0.29, which is in what Hiberty and Shaik have called the charge-shift category (i.e. NOT a covalent bond). The Laplacian isosurface is shown below, contoured at 0.25, and you can see each of the bond-critical points for the ten Fe-C regions is shrouded in blue (a positive Laplacian). So, NOT a pure covalent two-electron bond of the Lewis variety then(?). Centroids of ELF basins for ferrocene. Click for 3D. Yes, there again are C-Fe disynaptic basins! But the integration of the basin is a measly 0.3e (of ~3.1 electrons for all ten Fe-C bonds). Of course, ELF can detect the difference between covalency and ionicity (the disynaptic basins vanish for ionic bonds), and the low basin count suggests a fair degree of the latter. The ELF function itself is pretty, and is shown below. We can see that ferrocene has departed a long way from Lewis' model of an electron pair bond, or perhaps even from the covalent bond. But at least we can be assured that the connection table often used for searching for ferrocene and its derivatives is not a fiction! Next, uranocene! This entry was posted on Sunday, April 17th, 2011 at 3:02 pm and is filed under Interesting chemistry. You can follow any responses to this entry through the RSS 2.0 feed. You can leave a response, or trackback from your own site. A footnote to this post, I allude that Langmuir was the first to suggest that elements of the first transition series formed stable, and as he called it complete compounds if their shared valence (he referred to it as the sheath of the atom) contained 18 electrons. We now call this the 18-electron rule for transition elements. Langmuir gives examples of this genre as Fe(CO)5 and Ni(CO)4. He was of course spot on! But this article has other points of interest. 1. Langmuir presents the 18-electron (and for good measure the 32-electron) rules as postulates. There is absolutely no indication of how he arrived at these postulates. With Fermat (and his last theorem), at least we have a footnote! Langmuir simply proceeds on the basis that such a postulate explains a lot of chemistry. It was probably not until around 1927, when the Schoedinger equation was solved for the hydrogen atom, that a theoretical basis emerged. 2. Langmuir’s second postulate was that two atoms may be coupled together (we say bonded) by one or more duplets (we now say electron pairs) held in common by the completed sheaths of the atoms (we now say filled valence shells). By more, he means two, but near the end of his article, speculates that some types of exceptional compounds, citing HC≡CH, N2, CO, CN– as examples may merit a triple bond (he cites Pease as having suggested this first). This is clearly such a radical idea (in 1921! ), that he cautions that it will need careful study. I cannot resist include this link to a diagram produced in 1860 by Loschmidt, in which he very clearly draws a triple bond in the cyano group! 3. Also of interest is what Langmuir does not say. For example, he cites nitric oxide, NO, as an exceptional molecule, bundling it in with the triply bonded systems listed above. However, he fails to mention that it has one unpaired electron, since he has introduced only the electronic duplex as a bonding concept. The reasons for this may originate from G. N. Lewis’ idea of shared covalency in the form of an octet of electrons arranged in a cube, whereby one shared duplet corresponds to a shared edge, and two shared duplets a shared face. This pictorial concept does not easily deal with sharing an odd number of electrons (five in the case of NO), or come to that six electrons (for triple bonds). In fact Pease had solved the triple bond problem by recasting Lewis’ 8 electrons at the corners of a cube by a tetrahedron of four electron pairs, in which a shared face corresponds to a triple bond. 4. Memories of Lewis’ cube model might have also been responsible for Langmuir’s failure to anywhere in his article mention benzene. Also in 1921, J. J. Thomson had in fact published his thoughts on benzene, where he clearly indicates his belief that the C-C bonds had three shared electrons. It was in fact becoming clear that fixed cubes or tetrahedra as models for bonding would have to be abandoned, but again we had to wait until quantum mechanics had matured (in particular the concept of σ/π separability by Hückel) to explain the spatial arrangement of the three electrons in benzene (in effect, we now treat each term of the series 2(1 + 3 + 5 + 7 +…) as having different angular solutions). I mention one final precient observation, this time by Lewis himself. He had speculated that colour in molecules might be due to weakly held electrons. Again, spot on! Might one be tempted to consider the interaction between the central iron and each cp ring as largely electrostatic. i.e. 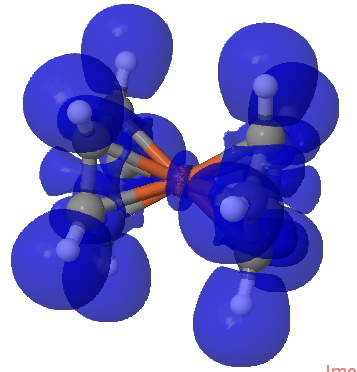 the attraction of the iron (ii) cation to the cyclopentadienyl anion? Responding to Steve, the ELF method does tend to distinguish between ionic and covalent bonding. If the electrons are located in disynaptic ELF basins, we might map that to covalent electrons, and if they are in monosynaptic basins, then the bonding is ionic. For ferrocene, there are only ~3.1 shared electrons located in the ten disynaptic basins between Fe and the carbons. 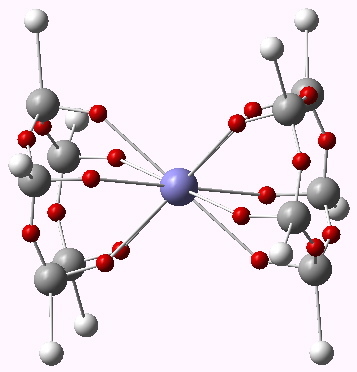 The missing electrons are largely located in the C-C regions (~2.64 per C-C bond) and the C-H bonds (~2.2), which does indeed resemble an ionic Cp ring. So indeed one could reasonably say the interaction is predominantly ionic, but with a significant covalent component.